When a number of criminals begin to die unexpectedly, many people are pleased, seeing it as representative of divine retribution. The police determine to establish the cause. To this end they employ the assistance of “L”, a shadowy figure, but undoubted genius-detective, who offers to find the person he believes is responsible. 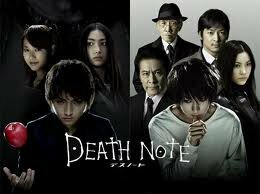 The killer is none other than the police chief’s own son, “Light”, whose sense of injustice becomes deadly when he discovers the “Death Note”, a notebook of the demons which will cause the death of any person whose name is written in it. He is accompanied by Ryuk, the demon whose book he has taken possession of. The film is well-paced with many twists as Light and L play their cat-and-mouse game. The effects on the demon are not flawless, but for the most part the gripping story makes this a minor issue. Shusuke Kaneko’s direction creates the right balance of realism and fantasy. The atmosphere is tense, with an anything-can-happen feel. Tatsuya Fujiwara brings real emotion to the character of Light and Kenichi Matsuyama is suitably oddball in his portrayal of the mysterious investigator L.
The film’s story is the main attraction here, with controversial issues such as justice and criminality played upon heavily (at one point Light can be seen reading Nietzche’s “Beyond Good and Evil”). An exciting action film with atypical philosophical underpinnings. Based on the Manga by Takeshi Obata.